Anyways as husband explains it - England is like the home of Indian food (I don't get it but that's what I'm told) and despite this fact when we visited England we actually never went out for Indian food. We do have some favourite Indian food spots here in the city and Samosas have always been one of the things I love so when I came across this recipe in Canadian Living The Ultimate Cookbook I was very excited and knew I had to try making it. These little pastry filled jewels are not hard by any imagination but they are a time consuming process. The entire thing took me well a long time (I was tag teaming two recipes) but I would say in total it would be a good hours worth of work so next time I would double the recipe and make more of them for probably not that much more time. The most time consuming part of it was the filling of the Samosas so I figure if I can prepare everything next time and rope in some help for that I should be good to go. The pastry is very similar to making a puff pastry so I treated it like that and had a good result. I learned the very important part of making sure the dough is sealed ALL the way around. But other than that this was a big success - so much so I didn't get many pictures and the monkey managed to try and sneak some every day for lunch and then would grab them out of the fridge for a snack - they didn't last long at all! I served these with the two chutneys I made (see recipes here) as opposed to the Cilantro Chutney in the book. Deep Fry thermometer - now I figure I can use my candy one in the fryer but the bottoms and entire thing is set up differently so I like using them for their specific purposes. In a bowl with a pastry blender (or food processor which I don't like) combine flour, cumin seeds and salt; pulse or cut in butter until in fine crumbs. Stir in milk until ball beings to form. Press into ditch, wrap and refrigerate for 30 minutes. In large pot of boiling salted water, cook potatoes and carrots until tender (about 10 min) drain. Add onion, garlic, ginger and salt; cook until softened, about 3 minutes. Stir in potatoes mixture and peas. Add lemon juice and cilantro - stir to combine well and let cool. Cut dough into 12 pieces; form each into a flat round. On floured surface roll out each piece into 6-inch circle; cut in half. (I just rolled out the entire sheet and used a large cookie cutter to make circles which I then cut in half - this made smaller samosas and more of them). Fill with 1 tbsp potato mixture (I just filled with as much as i could fit and still close the dough). Moisten top inside edges of the pastry; press to seal - make sure ALL SEAMS ARE SEALED. Trim jagged edges of pastry; crimp edge with fork. Pour enough oil into deep saucepan or pot to come 2 inches up the side (I just use my wonderful deep fryer). Heat oil until 350F (again I would buy a deep-fryer thermometer - I have about 4 different kinds of thermometers in my kitchen totally worth it). 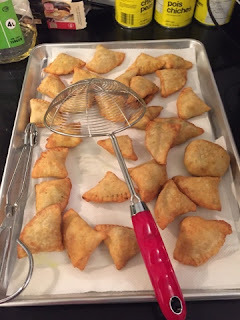 Work in batches, deep-frying the samosas, turning often until golden brown (about 4 minutes per bath; I would rescue them from the oil and then onto a paper towel-lined baking sheet. If you prefer to bake these (why? I'm mean just why?) 425F for 15 minutes).